For 30 years of his life, St. Patrick brought hope and optimism in the lives of Ireland, by establishing churches and monasteries across the country. The day of his death, March 17, 461 A.D., has since been a day for the Irish to celebrate the divinity of the saint for converting the pagans to Christianity: driving the snakes (symbolic of evil) from Ireland. From then onwards, the celebration has spread worldwide thus making the event a grand celebration. In America, where there are more people of Irish descent than in Ireland itself, St. Patrick's Day has become a cultural icon and across the world Irish and non-Irish alike join the party. Thus it would be wise enough to comment that though St. Patrick's Day is celebrated widely throughout the world, but the events of the celebration remain the same. Parades serve as the main ingredient for the celebration of the day. Almost every major cities celebrating the day, celebrate it with grand parades, which are attended by almost every citizen present. 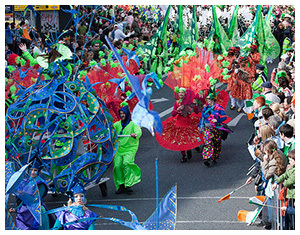 Dublin hosts the grandest parades. In the U.S. however, you'll find the best parades in Boston and New York. The parades are featured with marching bands, on road theatres and several dance programs arranged, the as main flavor of the day. Another very important aspect of this auspicious day is, especially for this occasion, the Chicago River is transformed from its usual murky green color into a bright green color ever can be seen. This whole activity marks as a respect to the true Irish spirit. 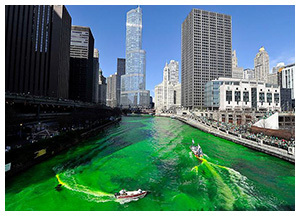 Thousands of people gather around the Chicago River to witness their river being dyed with the color of Irish. It should be noted St. Patrick's Day would be incomplete without a good drink of beer and whisky. Almost every pub and restaurant will be brimming with adequate quantity of whisky and beer. In fact almost every pub will serve you with glasses of the famous Irish Guinness or with some great Irish whisky. But amongst all the available forms of alcohol, Green Beer is considered to be the most perfect form of drink, for the occasion. 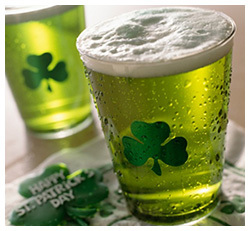 Almost every Irish soul quenches their patriotic fervours with drops of this famous Green Beer. St. Patrick's Day celebration without some hearty meals just cannot be possible. 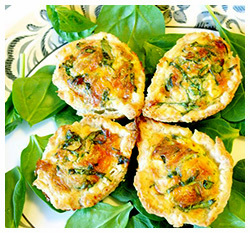 Irish foods like Irish Beef Stew, Shepherd's Pie and Irish Soda Bread enhances the mood of celebration further. Moreover it is noteworthy; no celebration would be complete without at least one good round of limericks, rhymes and blessings being said. Years of drinking have led the friendly Irish to create some of the best toasts you can find, ones that make you think then laugh out loud in agreement. Two most common phrases you're sure to come across are: Erin go Braugh (Free Ireland) and Sláinte (Cheers).